Al-Juhfah (Arabic:الجحفة) is one of the five miqats of hajj al-tamattu' and al-'umra al-mufrada. Those who go to Jeddah by airplane or ship, go to al-Juhfah and there they wear ihram. In early centuries of Islam, it was a thriving city, but today it is not a developed region. Ghadir Khumm is near this place. Al-Juhfah is a region 183 km away from Mecca and one of the important miqats of hajj al-tamattu' and al-'umra al-mufrada for residents of Syria and Egypt and those who pass by there. This city is 9 km away from Ghadir Khumm, near the Red Sea and today those who go to Mecca from Jeddah wear ihram there. This city was called Mahya'a meaning vast place. It perhaps was called so because of being located in a vast land between Ghadir Khum and the Red Sea. In narrations from the Prophet (s) and Imam al-Sadiq (a), both names of Mahya'a and al-Juhfah were used for this region. Due to its historical and religious location (being a miqat) and being on the way of commercial caravans, al-Juhfah has always been important. Reports suggest the development of al-Juhfah in first centuries of Islam. After the 5th/11th century, al-Juhfah gradually lost its position and began to decline, so that Yaqut al-Hamawi (d. 626/1229) mentioned its development in the past and its decline in his time. Also toward the end of 8th/14th century, Abu l-Fada' reported about al-Juhfah's destruction and isolation. According to the report of some travel writers, toward the end of 9th/15th century, this region even lost its religious function so that some reported that hajj pilgrims wore Ihram in Rabigh near al-Juhfah. In later centuries, especially in contemporary period, al-Juhfah regained its religious position once again; although it has not restored its developent as it had in the past and some ruinsof its past still remains. During the time of the Prophet (s), al-Juhfah had important events, one of its most important ones were some Sariyyas of the Prophet (s) such as Sariyya of 'Ubayda b. al-Harith (Sha'ban, 1/623) in Rabigh near al-Juhfah and also Sariyya of Kharrar led by Sa'd b. Abi Waqqas (Ramadan, 1/623). Upon the Battle of Badr when the polytheists were informed of the escape of the commercial caravan, some people including Banu Zuhra stopped going to the battle and returned to Mecca from al-Juhfah. In this region, Juhaym b. al-Salt dreamed killing of the chiefs of Quraysh in that battle, but Abu Jahl ridiculed him. There are also reports of historians about the Prophet's (s) staying in this place in the way toward Mecca for the Event of Hudaybiyya (6/628) and also wearing of ihram by some Muslims who did not wear ihram in Dhu l-Hulayfa. According to these reports, Muslims faced shortage of water in this place and the Prophet (s) sent some people to find water, but they returned without success due to their fear from Meccans and finally the Prophet (s) sent Ali (a) for it. It seems that it was in this place that polytheists were informed of Muslims' movement. The next year, the Prophet (s) wore ihram in al-Juhfah upon going for 'umrat al-qada'. When the Prophet (s) was going for the Conquest of Mecca (8/630), his uncle al-'Abbas joined the army of Muslims in this place. Some sources reported the Event of Ghadir in al-Juhfah and mentioned it as Ghadir al-Juhfah and called the event, Yawm al-Juhfah. Also, some others did not link the event of Ghadir with al-Juhfah, but reported the revelation of the al-Tabligh Verse and introduction of Ali (a) as the successor of the Prophet (s) in this place. In his report of the Event of Ghadir, al-Qunduzi reported saying the Hadith al-Thaqalayn by the Prophet (s) and introduction of Ali (a) as his successor in this place. The Prophet (s) called al-Juhfah a miqat for hajj. In some narrations, this place is introduced as miqat for Moroccans and in another report, it has been considered a miqat for the people of Syria. Accordingly, Great Shia scholars of fiqh considered al-Juhfah a miqat of the people of Syria, Egyptians, and Moroccans. Today, this region is a miqat for all those who go to Mecca from Jeddah. Also some sources have considered al-Juhfah a miqat in cases of emergencies for the people of Medina and those who go by there to hajj; i.e. those who do not wear ihram in Dhu l-Hulayfa, need to wear ihram in al-Juhfah the same as Imam al-Sadiq (a) who moved from Medina without wearing ihram and then wore ihram in al-Juhfah and referred to the narration from the Prophet (s) who gave permission to the weak and the ill to wear ihram in al-Juhfah. Some Sunni sources such as Maliki faqihs did not consider this comprehensively permissible and believe that only people from Syria who go to Mecca from Medina can wear ihram either in Dhu l-Hulayfa or al-Juhfah and can postpone wearing ihram to al-Juhfah. Also, some scholars considered it permissible to wear ihram from somewhere adjacent to al-Juhfah; i.e. those who have not passed miqat or have passed it without ihram with some reason, can wear ihram from somewhere adjacent to al-Juhfah. Some have considered this adjacency exclusive to al-Shajara mosque and do not consider it permissible to wear ihram from somewhere adjacent to al-Juhfah. After destruction of al-Juhfah, Sunni people wear ihram from Rabigh near al-Juhfah. Today, a big mosque is in al-Juhfah and lavatories have also been built beside it. Tribes of Zubayd are now living in this region. Also in this region, about 4 km away from the mentioned mosque, the ruins of 'Ulya palace from Abbasid era can be seen and near it there is an old market and a stone-laid path. 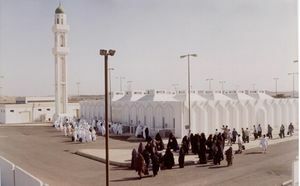 Pilgrims of hajj who enter Jeddah by airplane or ship, first go to al-Juhfah which is the nearest miqat and wear ihram there for performing 'umrat al-tamattu' or al-'umra al-mufrada. The material for this article is mainly taken from جحفه in Farsi WikiShia. This page was last edited on 30 January 2019, at 11:08.